It’s a double shot of David Bowie this week for all you music video fans! No stranger to giving the middle finger to convention, David Bowie just released the third music video from his new album “The Next Day”, this video giving life to his title track and starring Gary Oldman and Marion Cotillard. In his usual “fashion” (see what I did there? ), Bowie is courting controversy for using clerical references — everything from stigmata to creepy priests dancing with scantily clad, gyrating women in some sort of weird Vatican-sanctioned brothel. What did you expect, though? It’s David Bowie! 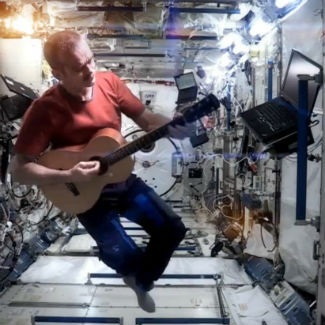 Recently, however, “Space Oddity”, Bowie’s hit from 1972, was remade by International Space Station commander Chris Hadfield from Canada, creating what is being touted as the first music video created in space. Multi-talented Hadfield’s decent crooning inserts a little modernism into the lyrics (Bowie-approved, natch) while he currently serves as the station’s first Canadian commander. The video had seven million hits by May 15th.